Why on Earth isn’t Every Day Earth Day? OFJCC Garden Pedagogista Debbie Togliatti ponders the impact of small actions in the big scheme of things. It’s the eve of Earth Day, and I’m wondering how people will choose to honor the one day out of the year when we devote ourselves to thinking about our planet and/or taking action with the goal of making the earth a better place. Perhaps some of us will go to a beach and pick up litter. Maybe you’ll get all new energy efficient appliances or commit to stop buying plastic water bottles. When considering the state of the earth, from global warming to polluted air and water, it seems daunting that whatever we do may have little or no effect. Yet, doing nothing seems a greater offense. When contemplating Earth Day, think simple and small. Whether you live on an acre or in an apartment, here are two places to get started. Water. The drought may be over but water conservation is still critical. Make sure the garden hoses have spray end nozzles attached. If you haven’t converted to drip irrigation, for heaven’s sake (or earth’s sake! ), please do so. Bees. Yes, bees. Worldwide, bees are in trouble and we need to do all we can to help them. Add plants that will attract them to your yard, deck or balcony such as basil, lavender and rosemary. Debbie Togliatti has been a preschool teacher at the OFJCC for 30 years. 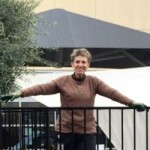 A former classroom teacher, Debbie recently left the confines of the classroom to become the Garden Pedagogista. All children, from 18 months to 5 years old, get to experience the wonders of the garden with Debbie’s guidance. She serves as a caretaker on a small farm in Los Altos Hills with 16 chickens, two goats and one rabbit and organically grows fruits and vegetables. In 2013, Debbie self-published her book, Growing Jewish Values: Cultivating Your Jewish Roots in Your Own Backyard.